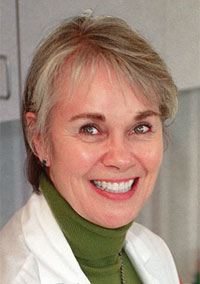 Marilou Terpenning is the managing partner of the four-physician, Santa Monica (Calif.) Hematology-Oncology Consultants, and also the health information technology superuser and guiding light into her group's deployment and customization of two, interfaced electronic health-record systems. She is the only physician from a medical group practice among this year's AMDIS award winners. Terpenning says that the group wanted the security of a name-brand, multispecialty EHR that could be certified for use in primary record-keeping. But the group also wanted an oncology-specific software system to handle the intricacies of support for the specialty. So, in 2006, it bought both—first, General Electric Co.'s Centricity EHR as a primary system; then, a few months later, IntrinsiQ's IntelliDose, as the oncology niche product. While there was an existing relationship between the two companies, and a degree of basic interoperability between their two systems, “We had to do a lot of the development of the interfaces,” Terpenning says. The practice extended computerized physician order entry in Centricity into IntelliDose, as well as built links to laboratories and to the group's practice management system, she says. Terpenning's practice is a beta site for the practice management interface. In oncology, according to Terpenning's AMDIS awards brief, “treatment planning, order writing, dose calculation and safety checks are critical to safe patient care.” The oncology system supports clinicians with specialty-specific automated safety checks. Order sets developed by the practice for chemotherapy have smoothed workflow and accelerated the pre-authorization process. Terpenning says that integrating the charge-capture functions of the oncology system with the practice management system has enabled the practice to achieve 95% accuracy on charges and lowered billing time in accounts receivable by as much as two days. The practice also has a Web portal for patients, which allows for patient communication.